I think I’ve mentioned it before – we moved a lot when I was a kid. Mostly we moved a lot within the same neighborhood. It wasn’t traumatic. It was just the way we rolled. I never really thought much about it, honestly. My parents have lived in their current home longer than any other home we lived in when I was a child, and they didn’t buy it until I was a senior in college. So, I took her advice. I hung pictures in our first, tiny apartment with dated, dark wood cabinets in the kitchen and all hand-me-down furniture. We made it ours, but I always dreamed of the day when I could have a nice house and new things and a queen-size bed…because that’s what you are supposed to do. I didn’t see why and how what I had right then was more than good enough – it already was beautiful. All of this contributed to, or was caused in part by, my battle with discontentment. The truth is, I’ve always had an eye for beauty. Color play is a gleeful game, and as my taste as evolved, so has my ability to take the unimpressive and make it into something interesting – albeit a little quirky. I know what I like, and I like all sorts of things. 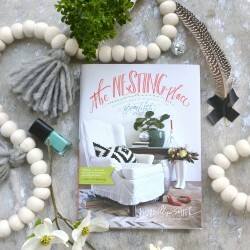 Myquillyn Smith’s blog and now book, The Nesting Place, her decorating and all around life philosophy, “It doesn’t have to be perfect to be beautiful,” helped me see the breathtaking beauty in what I already have. Her stories, her advice, and her blissfully quirky spaces don’t teach me how to make things beautiful, they teach me how to decorate my home with purpose – on purpose. They free me up to own my home decorating as a gift, an act of worship even. When I saw our house from the lens of a good camera, I just felt grateful for a God who allows us each a blank canvas to paint upon – because we all have a place that we call home. [And if you think that you can’t REALLY make your place home for various and sundry reasons, go out and get the book. Your mind will be changed.] Our home ISN’T perfect. There are unfinished projects and dust on the blinds, but I think, I hope, that our home says a lot about what matters to us as a family, about how we want people to feel when they enter our home. And I don’t want to miss that gift. I want eyes that see the power I have in the way I arrange, decorate, and use my home…no matter how imperfect it is. Heart change happens in the home. What we do with and in our spaces matters. It doesn’t need to be the same. Your purposeful space will be different than mine. It doesn’t need to be – dare I say it should NOT be – perfect. And isn’t that the beauty of our God? Our homes are tools that we get to use to let people into our stories…walls, floors, windows and all – another way for us to reflect the beauty, the diversity, and the sense of humor of our sweet God. What a gift! Get the book. Read it. Examine each photo with eyes that see. It’s like a really fun game of I Spy! [I’ve purchased four, count ’em four, copies so far for family members. It has mattered that much to me.] And then read Myquillyn’s blog for more inspiration and freedom to be who you are, for your family to be who it is in your home – and for it to be a place that people are eager to walk into and be who they are. P.S. Y’all are rocking it out on the social media #eyesthatsee business. This week – things in the home. What hidden gifts are there that you might normally miss? Separator image Posted in Home, Reads, Use What You Got.